Northwest Benefit Auctions is pleased to welcome Duren T. Harmon to our growing staff of auctioneers. 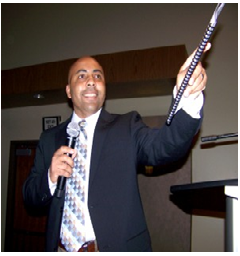 He is a dedicated and motivated Auctioneer based o ut of Warner Robins, GA. He has been a Georgia licensed Auctioneer since 2009. After serving 24 years in the United States Air Force, Duren decided to continue pursuing his passion as a professional salesman. As Chief of Reserve Recruiter Training for Headuarters Air Force Reserve Recruiting Command Robins Air Reserve Base, Ga. He led, trained and supervised 7 Professional Recruiter trainers to teach 100+ personnel annually to recruit qualified applicants to effectively meet Air Force Reserve Command (AFRC) Selected Reserve end-strength manning requirements. The recruiters targeted culturally diverse prior service and non-prior service prospects for unit, Active Guard and Reserve (AGR), and Individual Mobilization Augmentee (IMA) programs. Furthermore they go on site visits and assist trainees in correctly managing the lead management system to determine applicant interest and eligibility to discuss opportunities available to them within the Air Force Reserve. Duren ensured each recruiter established and maintained contact with the active duty and reserve facilities, high school staff, and related teaching universities and professional organizations in the assigned area and that they participate in special activities such as professions conventions and conferences. Duren is a graduate of the Senior Non-Commissioned Officers Academy, Gunter Air Force Annex, AL. Prior to graduating from high school in May 1984, he enlisted in the active duty Air Force in the delayed entry program in Nov 1983 and subsequently Basic Military Training in June of 1984. His first assignment was with the 43 Munitions Maintenance Squadron, Anderson AFB, Guam. He held two positions during his five year tenure at Anderson AFB. He excelled as an outstanding member of the Lead Standardization Crew and was selected to participate in two Giant Sword Loading Competitions. In 1989, Duren separated from active duty and joined the inactive ready reserve. After a four month break, he re-joined USAF and was assigned to Castle AFB, Ca for two years as a Weapons Release Team Member. In 1991, Duren took on a Special Duty Tour to Elmendorf AFB, AK as a Professional Military Education Instructor for the Elmendorf NCO Academy. He taught the Airman Leadership School Course for 4 years. After completing his 4 year tour, Duren separated through the SSB program and started a manufacturing company. While working his business, he decided to start participating in the USAF Reserve at Dover AFB, DE as an Education & Training Apprentice. In January of 1998, Duren was assigned to Dobbins ARB, GA as a line recruiter for the Air Force Reserve. He has spent the last 9 years as a Health Profession Recruiter, Line Senior Recruiter, Health Professions West Senior Recruiter, NCOIC of Reserve Recruiter Training; Chief of Training and Health Professions East Senior Recruiter. Duren and his wife Sirita have 5 children, Jasmine, Duren Jr., Janisha, Keristen and Keylon.